In the second part of his interview with Breitbart News on the corruption in Congress uncovered in Government Accountability Institute President and Breitbart News Senior Editor-at-Large Peter Schweizer’s new book Extortion: How Politicians Extract Your Money, Buy Votes, and Line Their Own Pockets, former U.S. Rep. Allen West (R-FL) said that new leadership in needed in Washington in both political parties to solve the issue. West was talking specifically about the revelation that every committee chairmanship and committee assignment for every member of Congress is for sale, documentation of which is found in Schweizer’s new book Extortion: How Politicians Extract Your Money, Buy Votes, and Line Their Own Pockets. The modus operandi of Washington DC is to attack that which it does not understand or threatens its existence. What is so threatening about the TEA Party? Apparently the fundamental principles it embraces. First, the Party believes government should be limited as articulated in the Declaration of Independence and resolved in the Constitution, which clearly restrains the power of the federal government. The Party believes in fiscal responsibility — and who wouldn’t be concerned with this wasteful spending and exorbitant debt? The TEA Party supports the free market economic system that has produced the world’s greatest economy, ingenuity and innovation. But most importantly, the TEA Party believes in and holds dear the immutable American principle of individual liberty and freedom. What American would not embrace those values? It seems President Obama does not and therefore his supporters and Hollywood acolytes like Robert Redford castigate anyone holding these values in opposition to the President as racist. This week we’ll celebrate the 237th anniversary of our independence. But are we a free people? SCOTUS made an ill-conceived ruling believing the choice of sexual behavior should trump the peoples’s referendum. We are free to love anyone or anything we desire in America, but that does not correlate to rights beyond the unalienable ones Jefferson articulated 237 years ago. In California we have a state-funded grant for the Los Angeles Unified School District to abuse the concept of public education by turning public schools into indoctrination factories, forcing children to spout the joys of Obamacare. The district listed as a primary outcome for its project, “Teens trained to be messengers to family members.” Covered California spokeswoman Sarah Soto-Taylor said staff have not questioned this goal. She stated, “We have confidence that the model LA Unified brought to the table will be successful in reaching our target population, which includes family members of students.” LA Unified will also use tax-paid staff to promote ObamaCare through phone calls to students’ homes, in-class presentations, and meetings with employees eligible for ObamaCare’s taxpayer-covered healthcare, the grant award says. Obama said he would fundamentally transform America. The time draws near to teach this usurper and charlatan the lesson our forefathers taught King George III. We will not be ruled by arrogance and edict. According to the Joint Committee on Taxation, the Buffett Rule would raise $47 billion over ten years. The President’s budget calls for adding $6.7 trillion to the national debt. The Buffett Rule would cover ½ of 1 percent of the President’s spending plan. If the government collects the Buffett Rule tax for 250 years, it would not cover the Obama deficit for 2011 alone. The Buffett rule would pay for 17 days of the President’s deficit spending over the next 10 years. The House passed Republican budget lowers the debt 62 times more than the Buffett Rule. Americans are taxed too much and too often. The average American employee will work 107 out of the 365 days per year to pay federal, state, and local taxes. 29.3% percent of their year is spent working for the government. In 1955 there were 409,000 words in the entire tax code. There are now 3.8 million words in the tax code. There are at least 480 tax forms on the Internal Revenue Service (IRS) web site. As a result of this complexity, it takes 300,000 trees each year to create and distribute all necessary tax forms. To deal with such a convoluted code, the IRS employs 114,000 people. That is double the amount of employees at the Central Intelligence Agency (CIA) and five time the amount of employees at the Federal Bureau of Investigation (FBI). Americans have been working countless hours to comply with our nation’s burdensome tax code, 6.1 billion hours a year according to the National Taxpayer Advocate. On April 1, 2012 the United States claimed the mantle of having the highest statutory corporate tax rate in the world at 39.2%. According to the World Bank, there have been 133 major corporate tax cuts globally since 2006. None of which were enacted by the U.S.
Of the 33 non-U.S. Organization of Economic Cooperative Development (OECD) countries, 28 cut their corporate rate during the past ten years while two had no change. 2012 marks the 21st year in which the U.S. corporate tax rate has been above the average of OECD nations. The Tornado(aka – Tanya Grimsley – @luvGodncountry) preps LTC West for an excellent, rousing Tax Day Tea Party Speech in Palm Beach County, Florida! He did not disappoint! 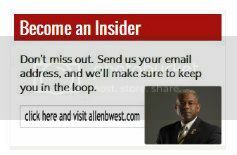 Congressman Allen West is interviewed by John D. Villarreal of Conservative New Media on a range of issues including the 2012 Election, President Obama, Presumptive GOP Presidential Nominee Governor Mitt Romney, Tax Policy/The “Buffet Rule,” Government Spending & the National Debt, the media, and more! This past week, the crotchety Majority Leader, Senator Harry “Extreme” Reid, (Lib-Dem NV); we are treated to another classic slap-down by a first-termer Congressman putting the irascible and testy Senator back on his heels. Reid’s personal lexicon of chastising words appears to be extremely pint-sized and limited to mostly just two words, ‘extreme’ and ‘draconian’ a sort of ‘cover all situations’ library. His recent use came while criticizing the Republicans and Tea Party participants for, as Dustin Stockton details, “attacking us for simply saying ‘no’ to endless government spending. As Stockton points out, however, “Luckily, we have leaders like the freshman Congressman, Rep. Allen West, who responded to Reid this week, saying “Reid’s attack shows how threatened he is by our (Tea Party) movement, and that he will stop at nothing to continue his party’s reckless spending habits. “This past Sunday on Meet The Press, we saw Senator Harry Reid talk about people being obstructionists. We saw him blame the Tea Party, we saw him blame Senate Republicans. He’s even blamed House Freshmen on the Republican side. Reid’s personal venom extends to any measures, no matter how unprofessional or otherwise that will stop the reelection of the Tea Party first year Congressmen who put our country’s needs first and foremost on their agendas. As my readers have noticed that in the past I have not endorsed any of the candidates; I kept looking for a strong conservative but the only one that had appeared was Michele Bachmann who did not wage a favorable campaign and dropped out. Newt Gingrich’s positions on the illegal immigration issue have been, to say the least, unclear most of the time. But his aggressive stance when threatened with possible “dirty” politics by CNN’s John King showed me that here was a man that will stand toe to toe with Barack Obama and when the going gets tough in a debate over fiscal responsibilities and other constitutional obligations, he will land the knockout punch without delay and retire the usurper in the White House.